Are You Abusing Your Social Media Voice? We’re told (and tell our clients) that one of the key benefits of social media is that it’s allowing a channel to be opened between customers and business, and vice versa. But is this new openness simply leading to abuse of the system? Are people now using this new voice they have to bypass proper channels and cause as much havoc as they can, purely because they have the ability to? Take a look at Doug Meacham’s recent experience with Best Buy. Doug’s post covers everything in full, but the gist is that he was upset at the price difference between store and online and decided to take it up on Twitter with Best Buy’s Chief Marketing Officer, Barry Judge. The resulting exchange and Doug’s unhappiness with that is the basis of his blog post. In the comments, there are two clear camps – one for Doug and his approach and one against. I’m swaying toward the latter. It’s not that I don’t think customers shouldn’t have a voice and be able to air concerns. One of my old jobs was working with the Director of British Telecom in the U.K. and resolving high level complaints, and I’m a huge advocate of businesses listening to and conversing with their customers. But there are ways to do that, and I don’t think Doug’s approach was the right one for a couple of reasons. So although there was quite a difference in the price (probably due to a simple error), they didn’t have to be the same. However, as Doug mentions, he brought this to the store salesperson’s attention and the price difference was overridden. So in that respect, his issue was dealt with. However, Doug decides that he wants to bring this to Best Buy’s attention – fair enough, and it may just help other customers not have to pay the higher price of the product. 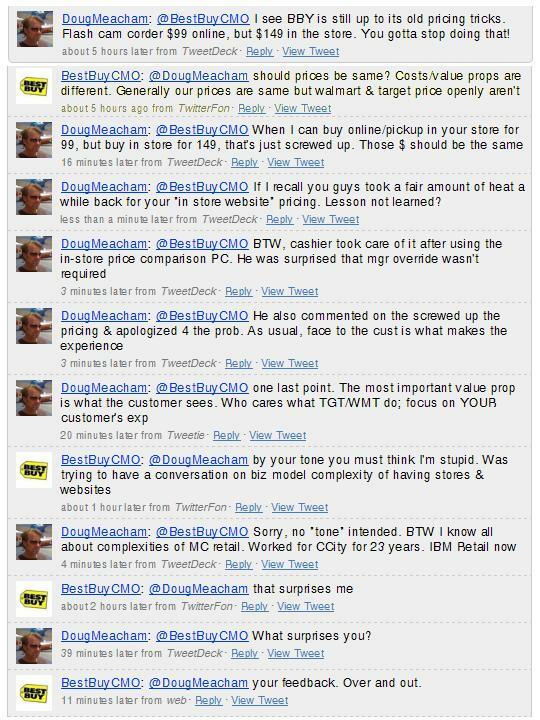 Doug’s method was to tweet the CMO of Best Buy and that led to even more issues. This is where I feel we need to question just how much people are “abusing” (for lack of a better word) social media and the conversations it allows. Without knowing Best Buy’s procedure, the normal channels for a customer complaint/issue would be – Customer Service, Supervisor, escalated call, Manager and then some form of high level complaints team if none of the previous roads worked. Why take it to the CMO? Because he or she is responsible for the marketing strategy of Best Buy’s products and offers? Does this warrant the question about a price difference? I don’t think it does. I’m kind of surprised Doug took his issue to the CMO. Doug has an immense amount of experience in retailing customer service and I would have assumed he’d take his points to either @BestBuy or one of the many other?Best Buy Twitter account(s) if he wanted to ask more questions. It’s the questioning of the CMO (and the accusatory tone of Doug’s points) that has me wondering about social media’s role in customer service. Sure, Barry’s response could have been more helpful but should he have had to respond in the first place? Chris Brogan writes a complementary piece to Doug’s post about how we’re “always on”. While this is true, there has to be some sense kept from the customer’s point of view. Just because social media allows you to tap into a higher level of employee doesn’t automatically mean you should. Or does it? Does social media mean there’s no such thing as customer service procedure and everyone is open to any and every question? Or are people using that new power inappropriately? Where’s the common ground?